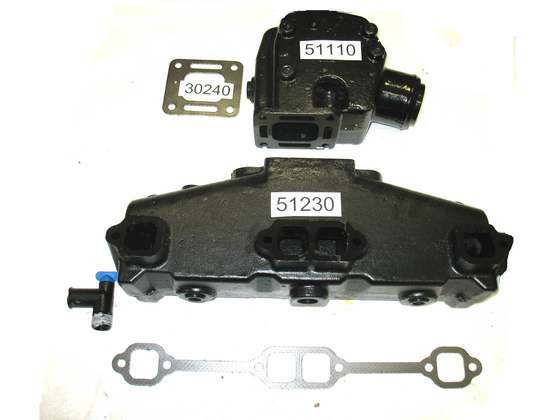 Kit includes studs, and mounting gaskets GLM # 31100 and #30270. 5.0 liter 305, 5.7 liter 350 small block motor water pump that fits both metal composite timing chain cover. Complete V8 port and starboard kit including gaskets, screws and drain plugs. 5.0L 305 and 5.7L 350 GM/Chevy motors, center rise style. Upper bellow. 3 inch center mounted riser to 4 inch elbow, or 3 inch to 4 inch y-pipe. V8 exhaust assembly with gasket. 860246A10. Used on either port and starboard side. 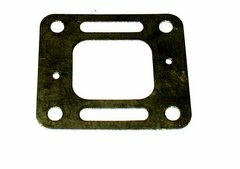 Center mount gasket for elbow P/N 51110 and 51140. P/N 30240-31100 Installation gasket set. P/N 30240 x 2 and 31100 x 2 included.